Battle of Nashville.Civil war battles Battle of Nashville. 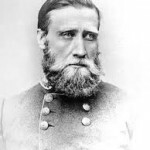 The final battle of the Western Theater of the Civil War, CSA Lt. General John Bell Hood will have a final stand with the CSA Army of Tennessee at the Battle of Nashville. 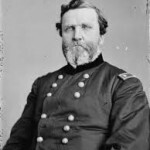 A skilled and devoted CSA General ( he lost an arm at Gettysburg) who believed in attacking, he will suffer a beating at Franklin after his assaults, and choose to take up defensive positions readying his troops for the last Battle of Nashville, Tenn.
Union Major General George Thomas ( the “Rock of Chickamauga”. ), will wait to reinforce his cavalry before his attack on Hood, commencing the final Battle of Nashville. Thomas has been informed he is up against the skilled Confederate cavalry General Nathan Bedford Forrest. Note: George Thomas was a Virginian who stayed loyal to the blue..his mother and sister turned his home portraits to the wall after he went with the Union. Major General George Thomas will untimately gain victory at the Battle of Nashville from actions combined with the Navy, rolling up the Confederate lines and taking large numbers of prisoners. The CSA Army of Tennessee under Hood is reduced, no longer a fighting force. 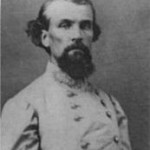 CSA cavalry General Nathan Bedford Forrest will fight 3 days of rear guard actions covering Hood’s retreat back to Franklin.